Angle Linear has been producing GaAs FET preamplifiers since 1980. Primarily used in commercial applications, these preamplifiers represent the best of present day technology in receiver front end design. We are continuously upgrading these amplifiers as newer devices are made available and as such, we now use PHEMT devices in all of our preamplifiers. PHEMTs are a better version of a GaAsFET device. Common port inductance, an integral part of every amplifier design, yields excellent input and output return losses while maintaining the low noise figure characteristics of PHEMT devices and enhancing stability. 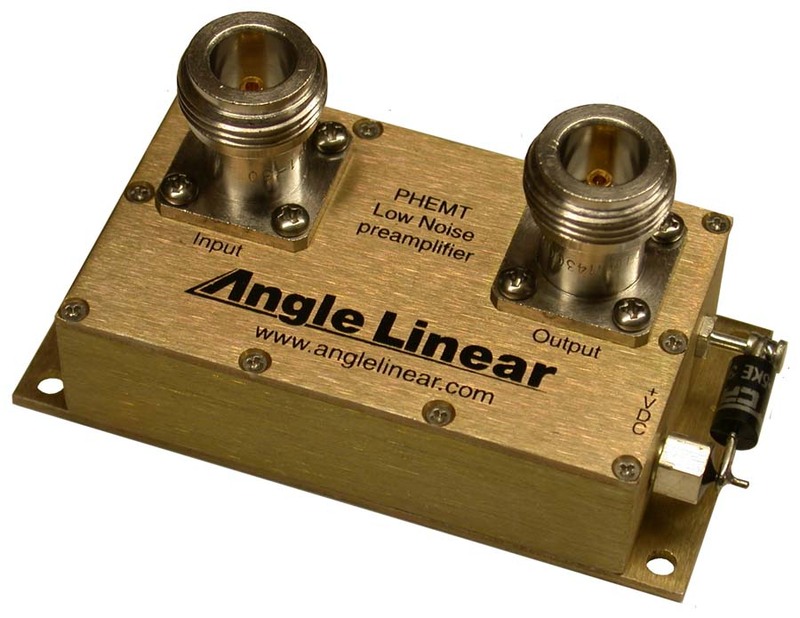 Angle Linear guarantees unconditional stability of every preamplifier. There are no stability problems when cascading our preamplifiers with Hi-Q band pass filters in repeater and receiver multicoupler applications. We have thousands of these amplifiers in operation throughout the world today. All tuning and signal path capacitors are ATC 600F low loss microwave type. Noise figure is typically 0.4 below 200 MHz, 0.5 dB to 700 MHz, 0.7 dB to 1 GHz. Gain is typically: >20 dB below 300 MHz; 17 dB to 510 MHz; 16 to 750 MHz, 15 dB to 850 MHz; and 14 dB to 1GHz. 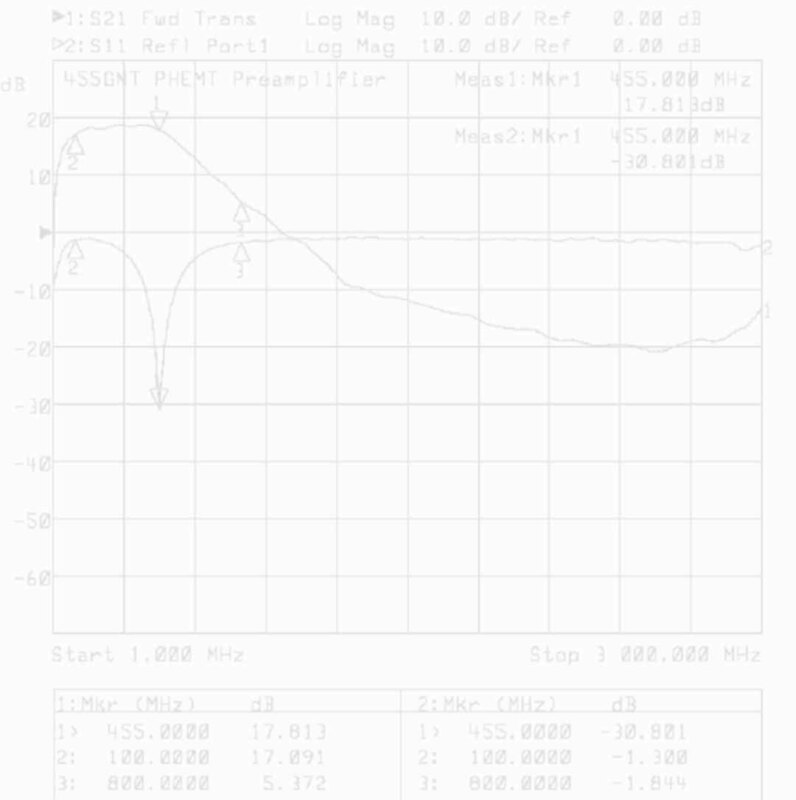 Input and output return loss are typically much greater than 15 dB. Output compression levels are typically +12 dBm and 3rd order intercepts are typically +26 dBm. Every preamplifier has over and reverse voltage protection. External and internal high voltage transient suppressors provides 40kV, 1 micro sec. pulse protection. Internal voltage regulation permits operation from +9 to +18 VDC with higher voltage options available. DC current requirement is typically 40 mA for the single amplifiers. Higher operating voltages (<35VDC) are available. Tri-Metal (Alballoy) connectors have ptfe (Teflon) dielectric with gold pins and are available in type N, TNC and SMA (ss). Dimensions: 1.5"x 2.5"x 0.7".